Quirky Jessi: Crocheted Meat Patty and More! Crocheted Meat Patty and More! Is that not the most pitiful little meat patty you've ever seen?? I've had my fair share of pathetic tv dinners with sad meat-wannabes, but that thing is pitiful...and adorable at the same time! Lol. 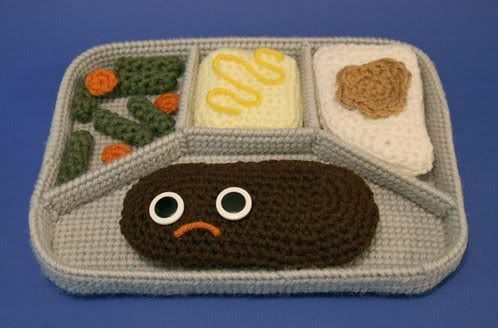 Check out other crocheted food here. You'll be delighted to find happy hamburgers, cute cannolis, a hot dog, and even a couple other non-food items. Who knew you she could come up with such thing? Hehe. You can find tons of her other creations and keep up on her new discoveries at her blog. I like the little frowny face! Some 8 years ago, we had made cheeseburgers for dinner. I of course put a frowny face on it (because it was sad it was going to be eaten) and then I put the pickle over the eyes, to be like a blindfold. Did you see the carton of eggs? that one is hilarious! I've only made myself a sad carrot so far. I'll have to dig out a pic. You totally should! I wanna see the carrot! Hehe.